Despite the title, National Treasure 2 - Book of Secrets has actually very little to do with a book of secrets. In fact, the book of secrets that you see Nick Cage holding in the extremely awkward-looking cover art only holds one minor clue on the overall quest prove that his great-great-grandfather was not behind the assassination of President Lincoln. And of course the only way to prove this is to find the Lost City of Gold. Please don't ask me to explain that because even after seeing the movie I still have no idea how that makes sense. While I found this sequel to be not nearly as good as the original flick, I did still enjoy it. Obviously, the first film has some issues with reality, but they were easy to forgive since the ride was so much fun. In this new film, however, the clues and challenges that the group must overcome is taken to even more absurd levels, which are not as easy to forgive. In the first film, Ben Gates spent practically his entire life tracking down treasure, where as here he is able to find an extremely remarkable treasure that people have been attempting to discover for hundreds of years... and within a span of what? A week? Maybe two? One additional to the sequel that I really loved was Helen Mirren cast as Ben Gate's mom. She played the role perfectly! The rest of the cast was fantastic as well, especially Justin Bartha who returns as Riley, Ben's computer-intelligent sidekick who often serves as the comic relief. I really wanted to have more of Riley, as just his lines and the way he delivers them are so freakin' hilarious. Ed Harris plays the main bad guy, which he is quite good at, but I just never really got a since of motivation behind his actions. I know they explained it, but his actions seems way overboard for the explanation, and I just wasn't feeling it. At any rate, this treasure hunt again takes us, the audience, to real-life, majestic locations. They're the real deal, not recreations on sound stages, and this is partly what helps to sell the realism of the movie while staving off the ridiculousness of it all. It's also gorgeous to look at. It's proof that scenes can definitely made better by putting spectacular sights in the background. Of course, that's not to say there are sound-stage sets. Nay, I say! In fact, the path to the City of Gold and the City of Gold itself were some amazing looking sets. I'd love to have some of those designers come over and turn my house into some kind of ancient city. I wonder if they do that to their own homes? This two-disc collector's edition, as the name implies, contains two discs, one for the movie and one for the extra features (except for the commentary, obviously, which is located on the first disc along side the movie). The bonus features include deleted scenes, which are preceded by introduction from the director, Jon Turteltaub. I like this method of doing it, rather than putting commentaries on the deleted scenes, which basically forces you to watch it twice if you want to learn the extra little info about the scene. There is also a blooper reel, which isn't as bloopery as I would have expected (yes, I know "bloopery" isn't a real word). 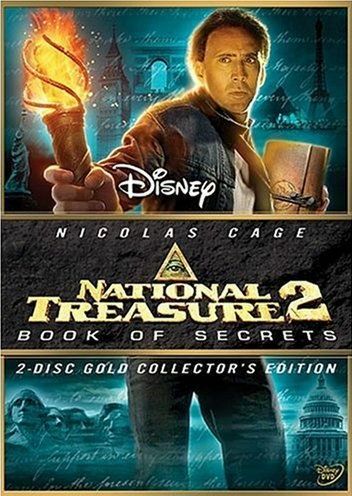 National Treasure 2 - Book of Secrets (Two-Disc Collector's Edition) , released by Walt Disney Pictures, is available starting May 20, 2008.